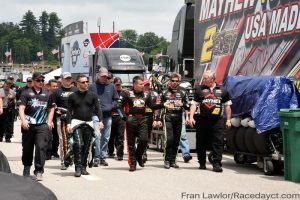 LOUDON, N.H. – New Hampshire Motor Speedway offered a jam packed schedule of action Saturday at track as part of Overton’s 301 weekend. The Xfinity Series 301 anchored the day, sandwiched around the Whelen Modified Tour Eastern Propane & Oil 100 and the K&N Pro Series East United Site Services 70. RaceDayCT photographer Fran Lawlor was on site and on the move throughout the day catching all the sights to be seen. Check below for The Fran Files from the day in Loudon. Some nice pictures there Fran. I’m sure Howie our friend would be proud of you. Well done Fran, happy to see some snaps up here! Hope all is well! .. embedded racing question – what’s up with the BRE team, great to see Rowan doing well and the 3 car running back up front. Is that still a BRE chassis? Any insight to the resurgence of Ole’ Blue? Goldy, the 3 is a BRE chassis. Last season they were blowing up engines frequently. I think four or five times. When they ran last year, without blowing up an engine, they ran very good. Hope they don’t have mechanical issues and keep up the great performance.